The frame's FACT IS-X 11m carbon fiber construction stands as the pinnacle of lightweight, efficient, and tough trail performance. 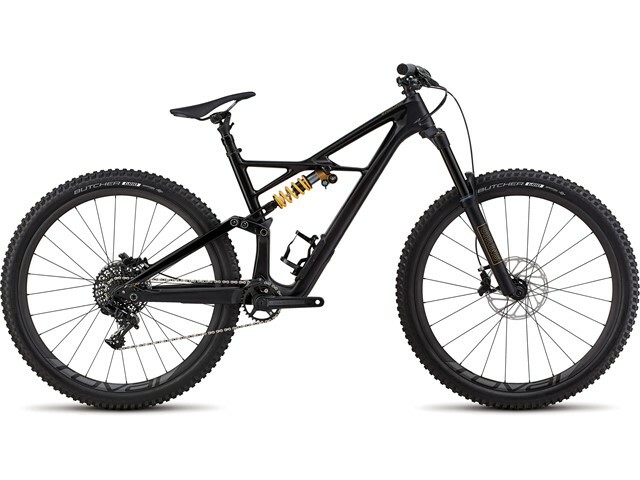 It's been built off our 29 Geometry, which also lends itself to running 6Fattie wheels and tires (only a 5mm BB drop), in order to provide an aggressive, well-rounded ride. And with internal Command Post IR routing, a return to a threaded bottom bracket, and an integrated SWAT™ Door at the down tube, you get a bike that's clean, dependable, and ready for anything that the trail has to offer. Featuring a three-chamber air spring and TTX (Twin Tube) damping, the Öhlins RXF 36 fork perfectly mates stiffness with a plush, responsive ride quality, and stays smooth and high in the travel without compromising bump absorption, traction, or stability. It also features high-/low-speed and rebound adjustments, and sports 160mm of plush travel.